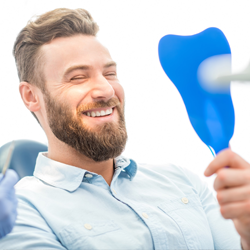 At the Calimesa dental office of Scott Parker, DDS, we offer a variety of cosmetic dentistry services to help patients get the picture-perfect smiles of their dreams. One of the most popular cosmetic treatments we offer is teeth whitening. Many of the patients who visit our office have already tried over the counter teeth whitening products with little to no success, so it’s important to understand that we offer customized teeth whitening products that deliver predictable results. If you want to find out more about teeth whitening and our other cosmetic dentistry treatments, call our Calimesa dental team to schedule a consultation appointment today. For most patients, teeth are bright white when they erupt from the gum line. This is because of the white color of the calcium minerals that make up tooth enamel. As we age and teeth are exposed to staining materials or we experience tooth decay and other oral health concerns, smiles begin to appear less white. 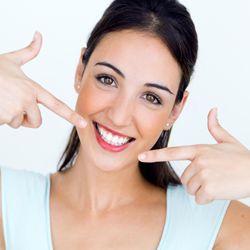 A bright, white smile makes you look younger and healthier, and who doesn’t want to look young and healthy? Does Professional Take-Home Teeth Whitening Work? No treatment is right for every patient, but if we determine that teeth whitening will be effective to remove your stains, our take-home kits are your best option. Store bought whitening products are inferior due to the low doses of whitening gel and ineffective application techniques. Our teeth whitening kits deliver predictable results up to ten shades brighter. 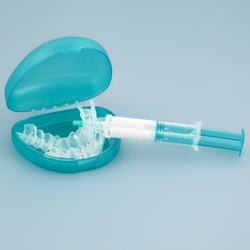 The reason our at-home teeth whitening kits are so much more effective than over the counter products is two-fold. First, we use a customized dosage of activated, professional grade whitening gel. Second, you apply the whitening gel using custom fitted application trays that seal the whitening gel onto the surfaces of teeth where it belongs and prevents saliva from accessing and neutralizing the whitening agent. The treatment is completed with 10 to 14 daily applications of about 30 minutes each. How Long do My Results Last? Once you’ve achieved your desired teeth whitening results, you should be able to maintain them indefinitely with proper at-home hygiene, regular dental checkups and teeth cleanings, and a few touchup days each year. We typically encourage patients to take “whitening weekends” two or three times a year in order to maintain their teeth whitening results. It doesn’t literally need to take place over the weekend, but you should apply your teeth whitening gel using your custom trays for thirty minutes over two days. Most patients can maintain their whitening results doing this twice a year, but patients who drink a lot of coffee or consume other dark colored foods and drinks may need to take whitening weekends more often. Talk to our team about your results and touchup days to ensure the safety and effectiveness of your treatment plan.